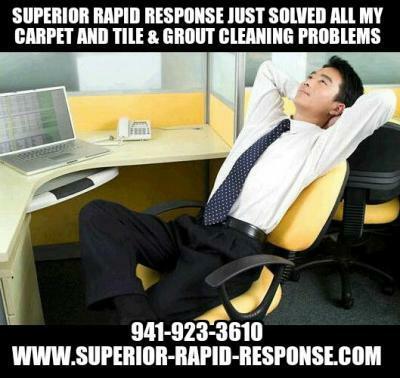 Superior Rapid Response, your commercial carpet cleaning expert, is located in Sarasota, Fl. If you are a Property Manager, Director of Maintenance or an Office Manager in charge of designing a commercial carpet cleaning or tile & grout cleaning program, Superior Rapid Response can custom design a commercial cleaning program that will meet your cleaning requirements and is within your budgetary constraints. Day & time of the week work is to be performed. After analyzing your property, we will custom design an ongoing maintenance program that will keep your carpet and tile & grout clean. We know you have a hectic schedule; our goal is to help you stay within your budget and reduce your workload. If you are looking for an office cleaning service, look no further. Our professional cleaning staff is the best that Sarasota has to offer. They are highly trained and take pride in their attention to detail and customer service. We can custom design a cleaning program that can meet your strictest requirements. To schedule your free commercial carpet cleaning, tile & grout cleaning or cleaning service estimate, call 941-923-3610 or visit us at www.superior-rapid-response.com. You will not be disappointed!